Taking advantage of slackening winds overnight, fire crews Wednesday reported 25 percent containment of the Bernardo Fire that charred 1,584 acres of brush west of Black Mountain — up from 5 percent. However, authorities expect more scorching heat, gusting winds and dry conditions Wednesday. 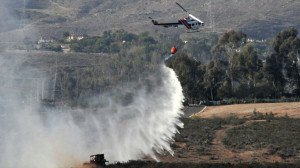 The Bernardo Fire erupted around 11 a.m. Tuesday off Nighthawk Lane, southwest of Rancho Bernardo, according to Cal Fire. As of 8 p.m., the then- roughly 800-acre blaze was only 5 percent contained but most of the flames had died down, said San Diego fire-rescue spokesman Lee Swanson. “Significant progress has been made overnight due to the fantastic hard work of all of our first responders and emergency personnel,” San Diego Mayor Kevin Faulconer told reporters this morning at a news conference at Rancho Bernardo Community Park, which was being used as an incident command post for the several agencies involved in fighting the fire. Fallbrook. Details will be shared when available. Meanwhile, San Diego Gas & Electric Co. reported nearly 3,000 customers had no electric power Wednesday morning in Highland Valley, several parts of Ramona/ Iron Mountain and Barona. Restoration was estimated at 11:30 a.m.
Those agencies included San Diego police and fire, Cal Fire, the San Diego County Sheriff’s Department and the Rancho Santa Fe Fire Protection District. The sentiment was echoed by San Diego fire-rescue Chief Javier Mainar. “To say the least, yesterday was a very challenge day for us here in San Diego,” Mainar said. “The success we enjoyed in not losing any lives or losing any structures was due in large part to the cooperation we had with all the agencies that were here, both on the firefighting and law enforcement side of this. “As you can tell today from the wind, we’re going to have a challenging day yet again,” he said, adding that there would be over 350 firefighters on the firefighting line today. Overnight, firefighters squashed about a dozen flare ups without any strong winds present. Because the winds are expected to pick up today, more flare ups in the daylight will pose an even greater danger than those that occurred early this morning, according to Mainar. “While the greatest danger has past, it occurred Tuesday, there is still in fact danger today because of all of the fire has not been contained and controlled,” he said. The Sheriff’s Department said anywhere from 25 to 45 of its deputies would be assigned to the incident Wednesday to assist should new evacuation orders be issued. On Tuesday, a total of 5,000 alerts in the county and 17,000 in the city of San Diego were sent to residents and business owners from Rancho Penasquitos to Rancho Santa Fe via texts, emails and phones calls, sheriff’s officials said. Some of those alerts were a warning, while others relayed mandatory evacuation orders. It was not immediately clear how many were evacuated but those who were, were invited to wait out the emergency at Torrey Pines High School and later, Rancho Bernardo High School. They were allowed back in their homes around 8 p.m. Tuesday. According to the San Diego Fire-Rescue Department, the goal for Wednesday was to reach 50 percent containment. Although no structures have been loss to the fire, two minor heat-related injuries were reported, said Cal Fire Incident Commander Ray Chaney. It was unclear whether the injuries were to firefighters or civilians. In addition to reaching 50 percent containment, authorities said they hoped Wednesday to keep the fire area to east of Via De La Valle, west of Dove Canyon Road, north of Carmel Valley Road and south of Camino Del Sur. Also evacuated Tuesday were several area schools in the Poway Unified School District. On its website, the district said all of its schools would be open today, though it was understood many pupils may be absent due to the fire. The Rancho Bernardo High School evacuation center at 13010 Paseo Lucido remained open today. The Torrey Pines High School center was closed. The National Weather Service said more strong Santa Ana winds — possibly up to 75 miles per hour in some areas — were in store for much of the county today. The NWS issued a Red Flag warning — signaling heightened wildfire danger, due to the scorching heat, low relative humidity and gusty winds. The alert for the inland valleys and mountain areas is in effect until 8 tonight. Should another major fire erupt locally, Chaney said Cal Fire is ready for it. “We plan as emergency agencies for other new emerging fires … part of our planning process is planning for diverting resources to any new starts in the county,” he said. The cause of the Bernardo Fire was under investigation.